The last known tree growing in the garden of Miss Scott of Graffham blew down in the gale of 1986. On hearing of the damage to the tree, the Rev. Donald Johnson and Lady Caroline Egremont took graft material from the fallen tree and distributed it to the National Fruit Collection at Brogdale and later to the nurseries of Frank Matthews who propagated it for West Dean gardens. It is currently cultivated as part of Brighton Permaculture Trust’s National Collection in Stanmer Park, Brighton. You can see a Bossom apple tree (planted 2011) in Home Farm Orchard, Stanmer Park ( map). 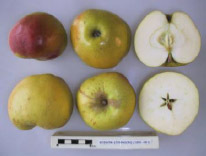 The apple is probably the variety described by Robert Hogg in 1851 and raised at Petworth House by Lord Egremont and his head gardener Mr Slade. Form also exists with less russetting and more rounded shape (Johnson 2008). The fruit ripens in early October and can be stored until January. The tree grows vigorously with upright growth.